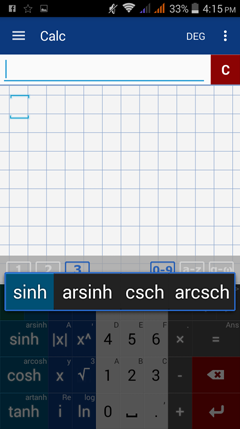 x ^, ln, i, x, sin, cos, tan, n!, degree key, /x/, root key, parentheses keys, and others. The active function can be seen directly on the input field as you switch between the functions. 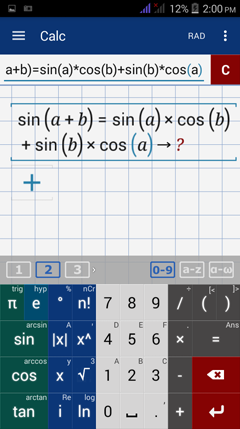 ﻿Below is a sample pop-up of the available functions under the sin (sine) key. 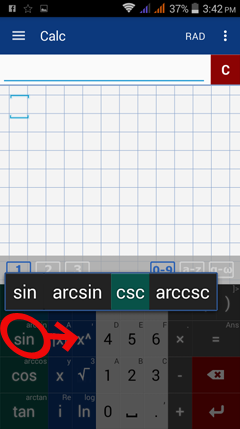 Other functions available on this key are arcsin (inverse of sine), csc (cosecant - the reciprocal of sine) and arccsc (arccosecant - the inverse of cosecant). The key highlighted in green is the active key. Hold sin and slide right to select csc, then release to enter. To cancel a selection, slide off of the pop-up and let go. An alternative way to enter arcsin is to tap the sin key twice. Tap three times to enter csc. Tap four times to enter arccsc. 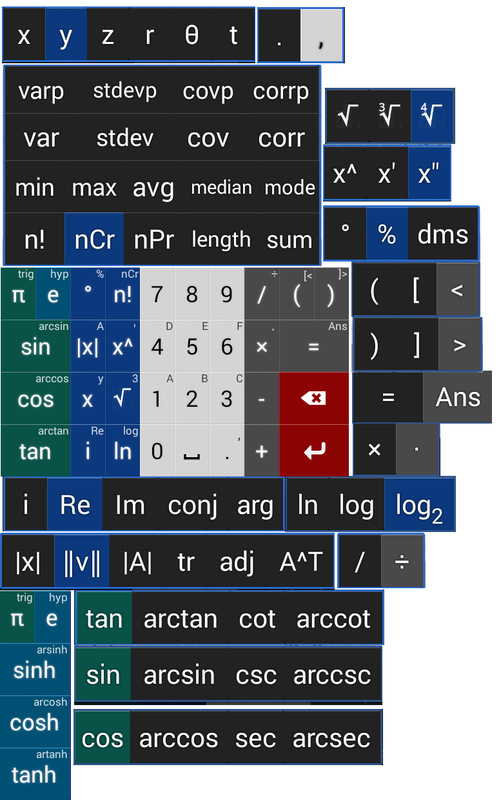 Generally, the number of taps corresponds to the order of the function in the pop-ups. To use a certain key in the pop-up, just tap according to the order of the function you want to use. Hold e to switch to hyperbolic functions. 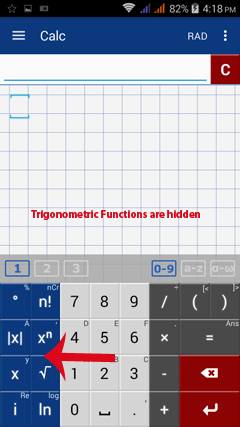 Hold π to switch back to trigonometric functions. 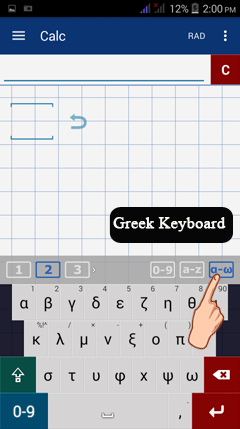 Use the keys on the top left of the main keyboard to switch between the default math keyboard, the Qwerty keyboard and the Greek keyboard. 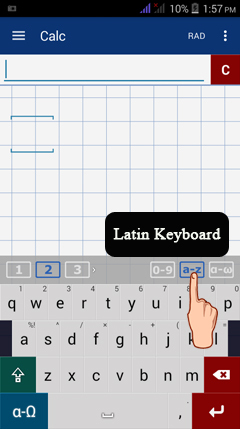 To enter an equation or argument using the Latin a-z characters, tap a-z to use the Qwerty keyboard. 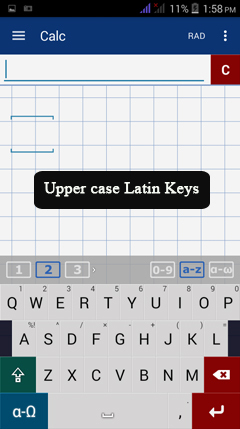 Tap the shift key to use uppercase letters. 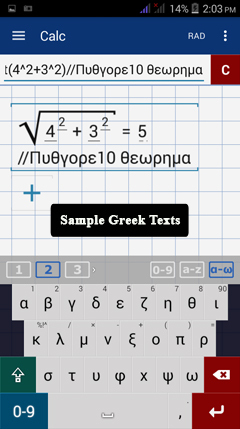 To enter an equation or arguments using Greek characters, switch to the Greek keyboard (α - ω). 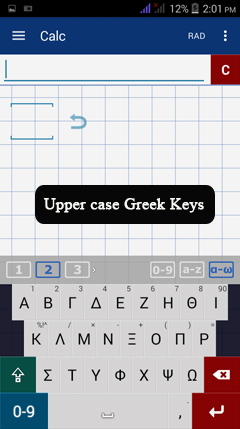 Tap the shift key to use uppercase Greek letters. 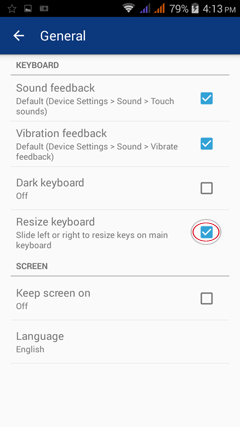 To hide keys not in use and/or enlarge other keys, resize your keyboard by dragging the default keyboard left or right. Below is a map of the keys and their respective pop-ups. The buttons shown in color are the main functions while the black buttons to the right are the extra functions listed under the same key. 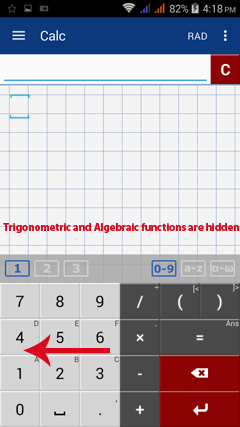 The order of the function key in the pop-up list tells you how many times you need to tap to enter a function. For instance, the degree button also has the % and dms functions. The main function of this button is degree. 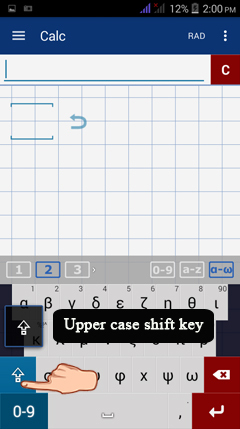 To input the degree symbol, tap the button once. Tap twice for % and three times for dms. 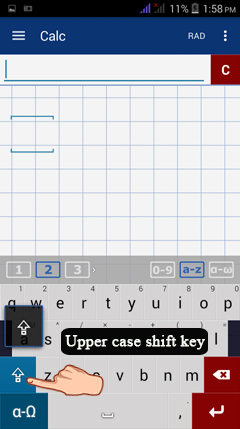 Note: Rather than counting the number of taps, it is easier to slide between the functions in the pop-up. Note: to use the nth root, input a 4th root and replace the index "4" with the desired root. Uppercase letters are often used to name a matrix, set, or when converting numbers from decimal to hexadecimal to binary to octal, or vice versa. Hold 1 to enter A. Hold 2 to enter B. Hold 3 to enter C.
Hold 4 to enter D.
Hold 5 to enter E.
Hold 6 to enter F.